One of my biggest pet peeves is throwing away food because it didn’t get eaten before going bad. I cringe inside every time I have to throw rotten food away, I feel bad for wasting food and because it wastes money too! But if you follow proper storage methods for the individual produce, the food will last longer which means less of a chance of wasting food (and money). I created a handy chart for you (and for myself!) to use when putting away produce. Be sure to pin the chart for later reference or grab the printable version in my resource library! But first, I’ll give you a quick overview. Some of the most common produce items that need to be stored at room temperature include (but is not limited to) bananas, garlic, potatoes, and tomatoes. When storing bananas, separate each banana from the stem and wrap the stems with plastic wrap to help them last longer. Be sure to keep tomatoes out of direct sunlight when storing them at room temperature. Most produce won’t be hurt if stored in the fridge but some can be hurt when not stored in the fridge. Be sure to put the following items in the fridge, berries, broccoli, carrots, corn, cucumbers, ginger root (this one surprised me! ), grapes, lemons, and lettuces. For any kind of berries, when preparing for storage, I recommend washing them and laying them out to fully dry on a paper towel. Then, in the container you plan on storing them in, lay in a folded up paper towel on the bottom and then put the berries in. You want to make sure your berries are dry and stay dry to prevent molding. If you are storing whole carrots, be sure to trim the green tops off before refrigerating. While cucumbers need refrigeration, they will do best when wrapped in a paper towel and placed in a warmer part of the fridge, so not in the crisper. Wash and store lettuce similar to how you would store berries, just also be sure to leave extra space in the storage container so that the lettuce isn’t packed in tightly, that will bruise the lettuce and it won’t look pretty. The following produce items will do great no matter where they are stored; bell peppers, onions, pineapples, winter squash (like butternut squash, pumpkin, acorn squash, etc. ), and summer squash (like zucchini and yellow squash). Onions do last at room temperature for a decent amount of time but they will last for TWO MONTHS in the fridge. Pineapples can be stored at room temperature when they have not been cut, after cut it does need to be refrigerated. For the best results, do not wash summer squash until right before you are ready to eat it. Some people make the mistake of allowing some produce to stay on the counter even after they are ripe, only to find that the rot quickly. The following produce items should be refrigerated once they reach ripeness in order to prolong their life expectancy; apples, avocados, melons (watermelon, cantaloupe, etc. ), and oranges. To store a cut avocado, store with the seed still in and brush avocado with lemon juice or olive oil, put in a tightly sealed container and use quickly. I have been doing a much better job of eating fresh produce since having Audrey, I was so sick and had so many aversions while pregnant with her that I couldn’t even walk past fruits and vegetables in the grocery store, so these tips have come in handy! And trust me, I have made plenty of storage mistakes and had food rot too early. And sometimes foods ripen and that rots must faster than expected (we all know the drama that is avocados) and that’s okay! Don’t beat yourself up about it, just learn from how quickly the food ripened so that next time you use it faster. Do you have any produce storage tips? Or a favorite storage container? Share a photo on Instagram with #iamajoyfulhomemaker. 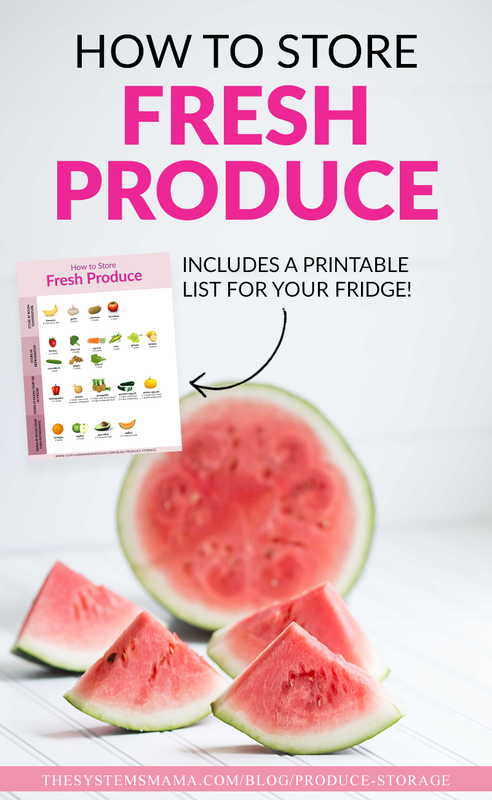 Don’t forget to grab your printable produce storage guide in my free resource library. Just sign up for my email list by clicking here and then you will have access to the library and the produce storage guide (and tons of other printables! ).